The bill to replace Obamacare narrowly passed in the House of Representatives about two months ago. 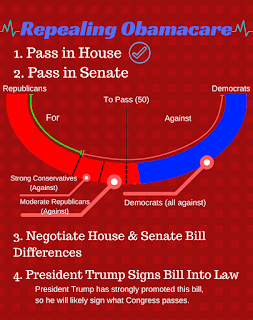 However, it will have to pass the Senate before it reaches the President Trump’s desk to sign into law. In the Senate, Republicans are weaker than in the house, where the Senate is split 52 Republicans – 48 Democrats. It will need 50 votes to pass (Vice President Pence can vote to break the tie). 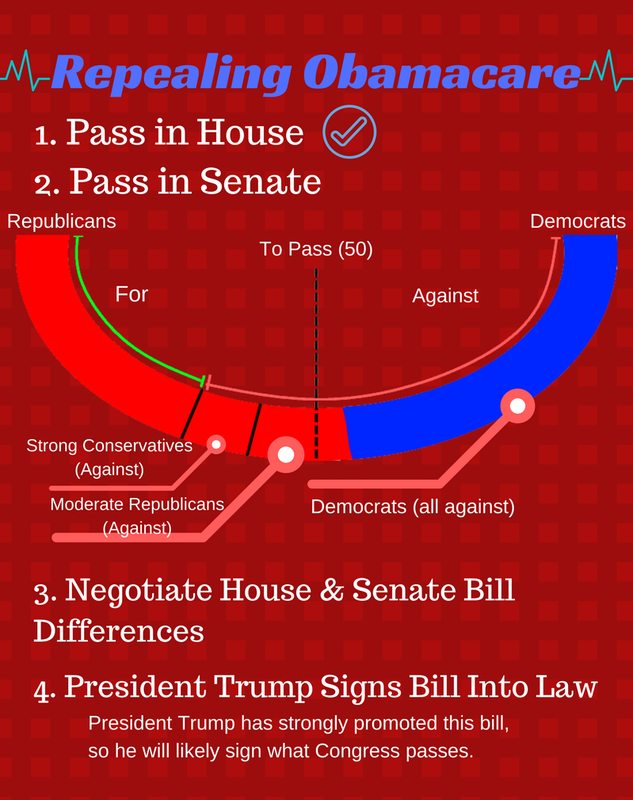 However, much like in the House, Republicans are divided over the bill. It’s a given no Democrats will vote for it, and nine Republican senators have already said they won’t support it. The problem is why. Some senators are against it because the bill doesn’t do enough to repeal what they see as wasteful spending, while others think it doesn’t spend enough to cover people’s healthcare. Adding more or less spending to the bill would make half of the nine even more dissatisfied while satisfying the other half. Republicans can only afford to lost two votes, so they are in a bind. It doesn’t help that only 17% of Americans support the bill. Incredibly, only about a third of Republicans support this bill to repeal Obamacare. The bill has also angered the Democrats because it was written with little debate or testimony. The Congressional Budget Office, which predicts the actual effects of legislation, published a report saying the bill, if it becomes law, would mean 22 million Americans would no longer have insurance. In light of this, the Republicans have pushed forward the deadline but have indicated they would even skip their summer recess (vacation) to get the bill done. What does the bill actually do?